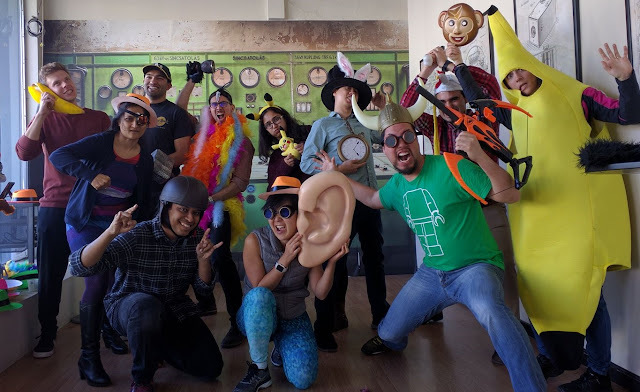 Reviewed by Brad: I was amazed to hear an escape room had opened up in my hometown of Elk Grove, just south of Sacramento, CA. 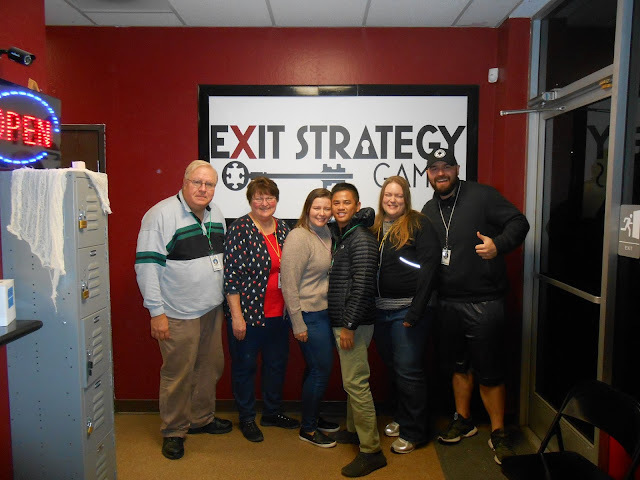 Over the Thanksgiving holiday, I couldn't help but drag my parents and cousins to Exit Strategy to give their rooms a shot! There are two games at this location: Torture Chamber and Conspiracy Theory. 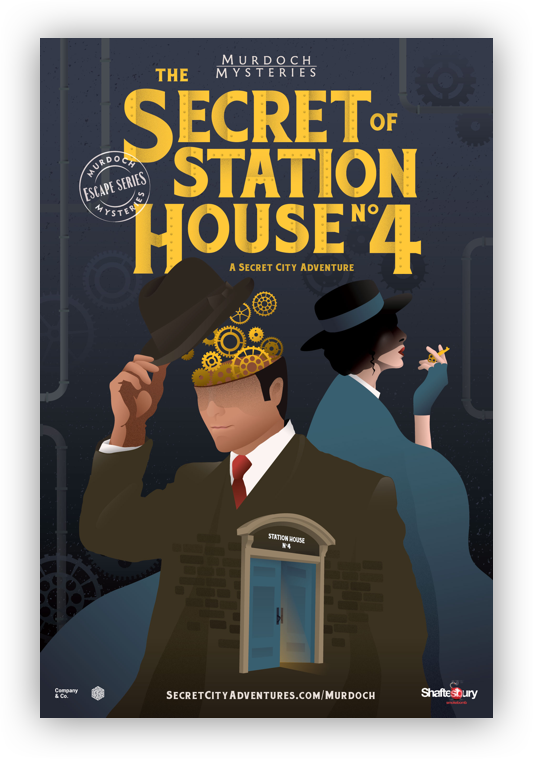 All of Exit Strategy's games are private rooms, and the price scales down for each additional player. They also have a second location with additional rooms in Mammoth Lakes, CA. "You and your friends have been captured and locked in the torture chamber of a notorious serial killer. In her dying moments, a previous victim left clues and puzzles to help you find your way out. Don’t take anything for granted. Even the most mundane item could hold the key to your survival. Don’t be distracted by the flickering lights or the eerie sounds. Your very survival is on the line. Escape … or die trying …"
"A video of a crazy-looking man comes on. He tells you that he is a local conspiracy theorist and apologizes for the gas he used on you, but he had to get away. He informs you that the gas will cause memory loss for about an hour. He also tells you that you are all members of the CIA. You’ve come to investigate him because it turns out his crazy conspiracy theories are turning out to be true. Next, he informs you that there are secret Soviet spies among you working as double agents in the CIA. Are you a real CIA agent or a secret Soviet Spy? Search for clues, solve puzzles, figure out who you are and who you can trust in 60 minutes before he blows up his apartment, destroying all evidence of his conspiracy theories, including you!" Torture Chamber: This light slasher-themed room is a mix of professional set design and Halloween store flair. It works, but it's not what many would consider an immersive experience. I was impressed with the effort put into the split-team experience at the start. Most puzzles ultimately come down to solving combination locks, but they aren't entirely trivial and relied heavily on teamwork to be solved. Conspiracy Theory: The set design is simple, but it works in the context of the narrative. I was excited to see some interesting puzzle types, and while combination locks are featured, and often (but not always!) prove the ultimate blocker to move forward, they are complemented by an engaging variety of puzzle types. What sets Conspiracy Theory apart is the additional element of determining who is part of the CIA and who is a Soviet spy. This plays into solving some of the puzzles on the main thread as well, but also has implications for who actually 'wins' if you make it out. With a group of inexperienced players this actually proved more of a nuisance than an enhancement, but with a more experienced group I think this would be a welcome novelty. Torture Chamber: 4 cousins all stumbling blindly around with bags over our heads waiting for the room to start. Conspiracy Theory: A puzzle reward dropping down with a bang and nearly giving the team members over 50 a collective heart attack. The intro videos were incredibly cringe-worthy. It feels like they're trying to capture the same intro flair that rooms from some of the larger franchises have mastered, but they were entirely too long and the acting was especially bad, especially for Conspiracy Theory. They also tried to jam too much rule explanation into the video, which was then repeated by the game master, anyway, and left me feeling exhausted before the room even started. We had an unintentional red herring from a bad reset in Conspiracy Theory, which also made the experience a little frustrating. Torture Chamber had an underwhelming finish. In the end, the team was surprised there wasn't an additional room or at least some other kind of content or a climax. It sort of sputtered to a stop with the last puzzle and suddenly the door opened and we were told we won. Could have been better. Both of these rooms were fun, but Conspiracy Theory might be a bit confusing for first-time players. Set design: Alright. Was a little hokey at times, but it still felt like effort was put into it.